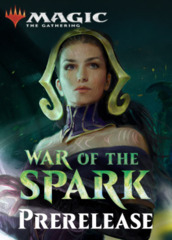 We invite you to get preview of the Magic: the Gathering War of the Spark set at Prerelease Weekend April 27-28, 2019 at any one of 5 different events at Game Night Games. EVENT A (MIDNIGHT 4/27/19): This sealed tournament will start when the clock strikes Midnight on Saturday, April 27, 2019. Check-in starts at 11 pm on Friday Night, April 26th. We recommend arriving at least a half hour before the Midnight start time. Pre-register as early as possible to ensure your spot in this tournament as we often sell out of MTG prerelease events due to space limitations. Deck construction will begin at Midnight (or as soon thereafter as possible) with tournament matchplay to follow. Players must arrive no later than 12:15 am. Players who arrive late will have less time for deck construction. Please allow time for nearby parking as the building will be full this date. FORMAT & PRIZES: Construct your 40-card minimum deck from a pre-release kit and play against others for prizes in a 4-round tournament. Prizes for all events will be awarded in War of the Spark booster packs but may also include additional merchandise such as playmats, deck boxes and sleeves. The event will run 4 rounds. Booster pack prizes will be awarded to players who win at least 2 of their 4 matches based on final rank. Winners of each event will also receive a special GNG Prerelease Champion’s playmat. SPECIAL PRIZE FOR DEFENDERS OF THE FAITH (Play all 5 Prerelease Events): Prove that you’re a true player with a will of iron by playing in ALL 5 GNG War of the Spark prerelease events to win a unique GNG playmat commemorating your titanic victory over time and space. SPECIAL NOTE: Prerelease packs will not be held for absent players, although a refund may be made if that player's spot was subsequently filled by a paid player present at the event. All players should plan on playing at least 1 round. If you have additional questions please call the store at 801-467-2400. See you at the event!